The question of when life first moved onto the land has been the subject of speculation for as long as anyone has realised that there was a 'first' to speculate about. Established terrestrial communities were clearly present by the latter part of the Silurian, but was there anything earlier? The reasonable expectation is that there was, at least on some level. Pretty much as soon as there was life inhabiting the oceans in prokaryote form, weather cycles would have been carrying bacteria and their spores onto their land. It is not unreasonable to assume that some of them may have been able to acquire a toehold in some attainable niche, and from there diversify to the surrounding environment. Later, other microbial and simple organisms may have joined them. But such organisms leave little trace in the fossil record. What were they like, how did they live? A paper that has just been published in Palaeontology (Retallack 2011) has described simple terrestrial fossils preserved from the Middle Cambrian, and may provide a rare glimpse of the early Earth. Reconstruction of Cambrian terrestrial biota from Retallack (2011). The remains described by Retallack (2011) are extremely simple: flat, thallose impressions called Farghera, subterranean threads known as Prasinema and buried ovoid structures called Erytholus. All of these are described as form taxa: that is, they represent a particular recognisable fossil structure whose relationship to other such fossils is unknown. Different form taxa may even represent different parts of a single organism. The linear, branching Farghera thalli were an average of just under 2 mm wide, though they could get much wider, and preserved thalli are often several centimetres in length. The living thalli would have been similar to an alga or lichen, either of which they could have been. The thread-like Prasinema are preserved as a central filament less than 1 mm in diameter, surrounded by a dark halo up to about 2.5 mm across. It seems likely that only the central filament represents the original central organism; the halo would have formed by microbes growing around the filaments as they decayed. Prasinema filaments could apparently grow to 30 cm beneath the original soil surface, and probably represent structures similar to fungal hyphae. Most unusual are the Erytholus, globose structures up to 2 cm in diameter, divided into internal layers with a broad central column. Retallack (2011) suggests a number of possible interpretations for Erytholus: vendobiont or xenophyophore (unlikely because of the terrestrial location), alga (again unlikely, because it is both terrestrial and buried beneath the surface), or fungal or slime mold reproductive structures, comparable to truffles. However, the truffle interpretation is problematic because truffles are produced to disperse spores through being eaten by animals. Obviously, this could not have been the case in the terrestrial Cambrian! A further possibility that I can think of is that Erytholus may have been some sort of resting structure, analogous to a plant bulb or tuber (though note that this interpretation would not necessarily exclude a reproductive function). As with the Silurian, I think it is important to remember that the environment would have been very different in those days in more ways than one might immediately think. There are parts of the world today where lichens and algae remain the primary ground cover, but we should be careful in assuming that such spots are close analogues of the Cambrian terrestrial environment. 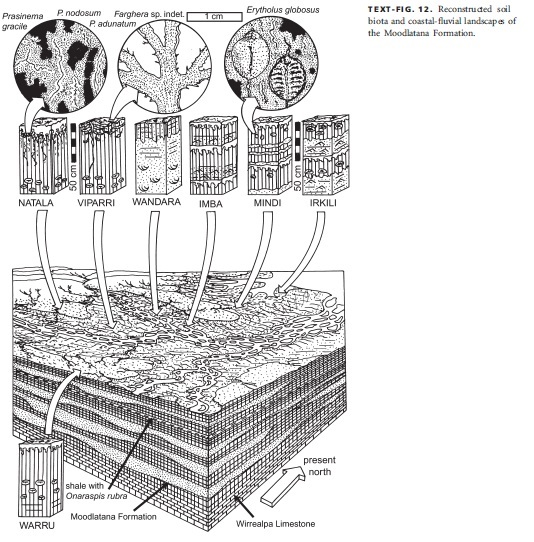 Such areas are today arid and/or highly eroded, but in the Cambrian lichens and algae would have also been able to dominate areas in which vascular plants would overshadow them today. I also find myself again wondering what effect the absence of a complex vegetation profile might have had on weather patterns at the time. Would winds have been stronger if there were less low-level wind breaks? Would the effects of rain events have been more catastrophic if water flow was less impeded by ground-cover (if Erytholus was indeed a sort-of-tuber, perhaps it functioned as a source of regrowth if the above-ground component of the organism was destroyed by weather?) If we could see the Cambrian environment for ourselves, there could be no doubt that we would find it utterly alien. Retallack, G. J. 2011. Problematic megafossils in Cambrian palaeosols of South Australia. Palaeontology 54 (6): 1223-1242. Perhaps it's me but "truffles in the Cambrian" is an amusing thought. "The question of when life first moved onto the land"
'Land' is here a bit of a relative concept, isn't it though? I mean, surely the immediate microenvironment of the very first, tiny organisms that left the sea would have been a film of water - meaning that they were still effectively aquatic? Now I find myself wonder whether multicellularity evolved more times on land or in water. I'd guess Eumycota has a terrestrial origin, while Metazoa has an aquatic origin, but what's the story with plants? The plant lineage was multicellular well before they made it onto land. Phylogenetically, land plants are nested amongst the multicellular green algae known as 'charophytes' (in the broad sense). Retallack is not the most reliable source in the world for this topic, and these supposed fossils of his are likely abiotic origin. Sorry that I failed to see your comment awaiting moderation earlier. Thanks for the reference; I'll look into it.